The Session Performances tab will allow entry of all the information about songs played during a session except for the personnel. 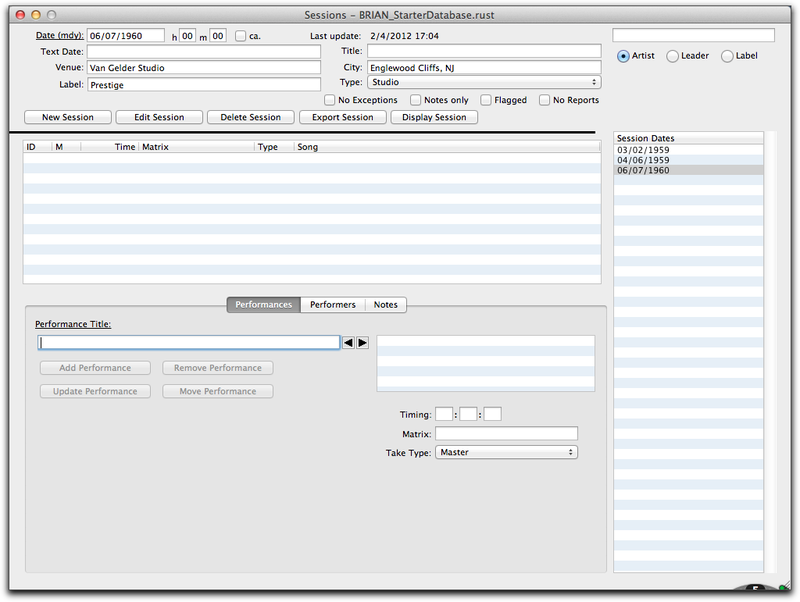 The personnel is entered on the Session Performers tab and will be discussed later in the tutorial. 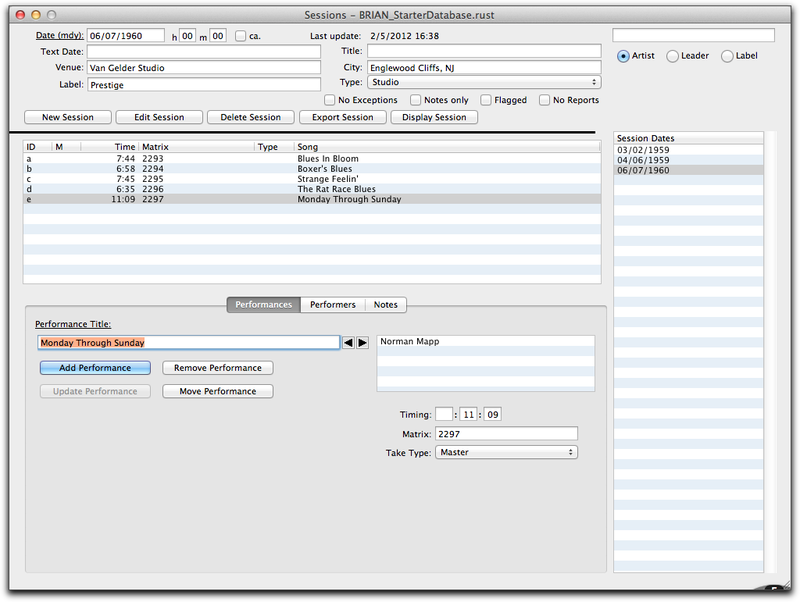 Select the Performances tab on the Sessions window to show the performances information. In this case, all the fields are blank because the session was just created and no performances have been entered as yet. But if any performances were entered, they would be listed in the listbox at the middle of the window. Unlike the previous windows shown in this tutorial, the Performances tab does not use the sequence of pressing the New button, entering fields, then pressing the Save button to add data. 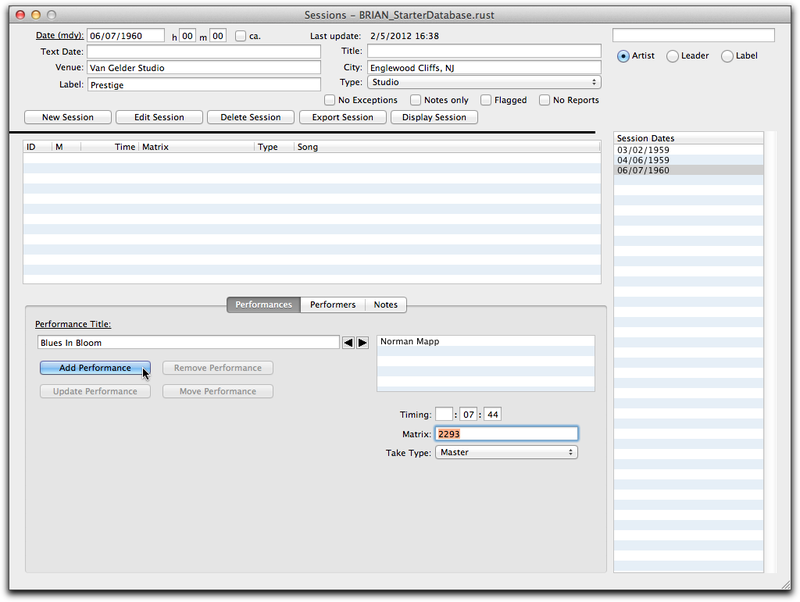 Instead, data is entered into fields and the Add Performance button is pressed to make a new entry. This allows for easier repetitive entries that are common for takes in a session. For instance, one song may be played 3 different times during a session with only the Timing changing. After adding the song the first time, it's only a matter of changing the Timing and pressing the Add Performance button to add an alternate take. 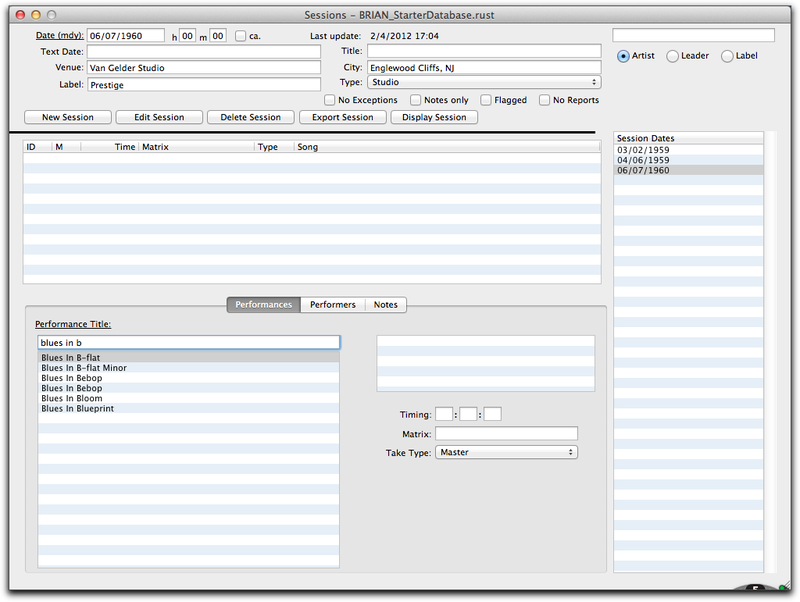 The first step in adding a performance is to place a title in the Song field. The Song field is a lookup field which means that as characters are typed into the field, BRIAN will search the database for a title that matches the characters typed. As shown below, the characters "blues in bl" have been typed in the song field and a list of matching titles, including the Blues In Bloom title needed, is presented in the selection list below the Song field. Clicking on the Blues in Bloom title in the selection list will cause BRIAN to retrieve the full song title and place it in the Song field. Also, BRIAN will retrieve the writer name(s) of the tune and place them in the writer names listbox to the on the right hand side of the window below the Song field as shown below. 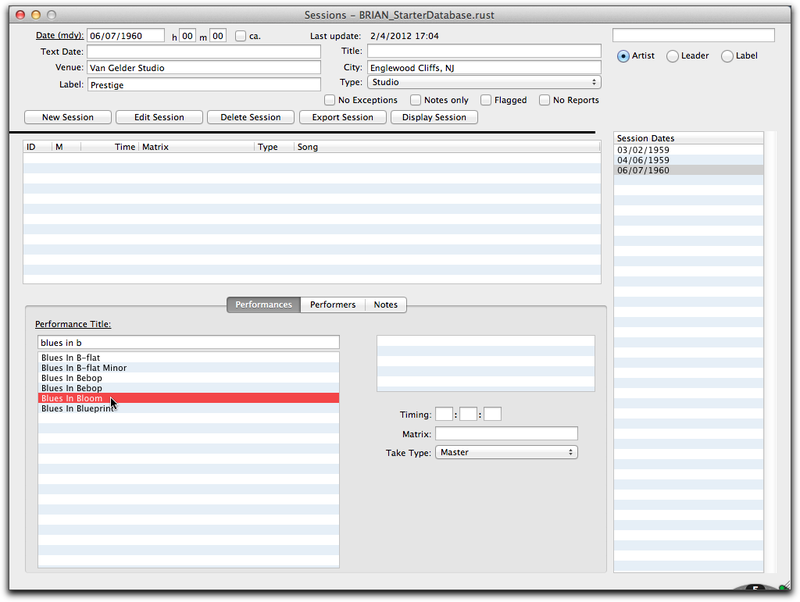 After selecting the song title of the performance, the timing, matrix and performance type is entered as shown below. The performance type is the popup menu below the song selection list and can have any values as designated in the Edit Popup window discussed later in the tutorial. Generally, the values will be such as: Master, Alternate, Incomplete, etc. Press the Add button to complete the entry of this performance to the session. When added, the performance will be listed in the performanc listbox at the bottom of the window. The picture below shows what the Performances tab will look like when all the performances are entered. Notice in the most left hand column of the performances list there is a single letter. This is an id assigned by BRIAN as performances are entered and used to refer to performances when reports are generated.